Dr Jonny is motivated by getting results for his patients. He treats the whole person and looks for the underlying cause of disease, discomfort and pain, as opposed to just treating the symptoms. He is trained in a variety of techniques to suit his wide range of patients. Dr Jonny is able to help everyone, from babies with asthma and colic to adults with multiple sclerosis and fibromyalgia. He is also able to help athletes with injuries or in need of rehabilitation. He will create a personalised chiropractic and wellness plan to suit your individual needs. 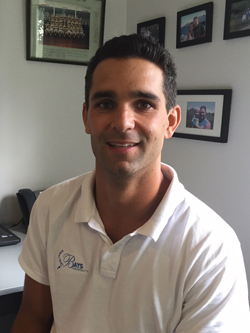 One of Dr Jonny’s specialties is using the Cox Flexion-Distraction table that is designed to treat chronic low back pain, disc herniation, prolapses and protrusions, as well as sciatica. Dr Jonny is also trained to treat dogs with spinal and pelvic problems. Dr Jonny grew up on the North Shore of Auckland. He is an avid rugby player and sportsman. He enjoys boating, fishing, diving, surfing and playing golf. Are you ready to experience a customised health care plan? Give us a call today.